Has your dentist recommended dental implants? This treatment option may sound bad at first, but it is a relatively simple procedure. Keep reading to see how dental implants can restore your smile. A dental implant is a tooth replacement that acts as both an artificial crown and an artificial root. To help understand this, there are two major portions of each tooth: The portion you can see and the portion under the gums. The portion under the gums is the root. The inside of this section is the root canal. The visible portion of the tooth is called the crown, which you can remember because of its shape! In effect, a dental implant replaces the part of the tooth that is both visible and not visible. An implant can be an effective and long-lasting solution for someone who has experienced severe tooth decay. An implant is generally the last option after a dentist determines that a root canal or filling cannot save the tooth. One major advantage of a dental implant is that it can preserve the appearance of your tooth. Since they take the place of both the crown and root of the tooth, they look and function just like a normal set of teeth. Your dentist can match the shape, size and color of your implant to look like nearby teeth. Unlike dentures, you do not have to remove dental implants to clean them each night. Simply brush and floss to keep them in good condition. Dental implants can last many years. While most will work for 15 years, some can even be functional for up to 25 years! The lifespan of your implants will depend largely on how you care for them. Implants are not immune to infection. Bacteria can grow in the spaces between your implants and gums. Your overall oral health will determine the success of the implants, so practice daily hygiene. Since implants are firmly rooted in your jawbone, they are often more comfortable than alternatives like dentures. They also come loose while eating, talking or during other activities. You do not have to deal with adhesives or bridges. Dental implants are designed to feel more like real teeth. Because of this, they will cause less discomfort whenever you are using your jaw. When is it time to speak with your dentist? The best way to have a beautiful smile is to prevent tooth decay with proper care. You should also see the dentist every six months. 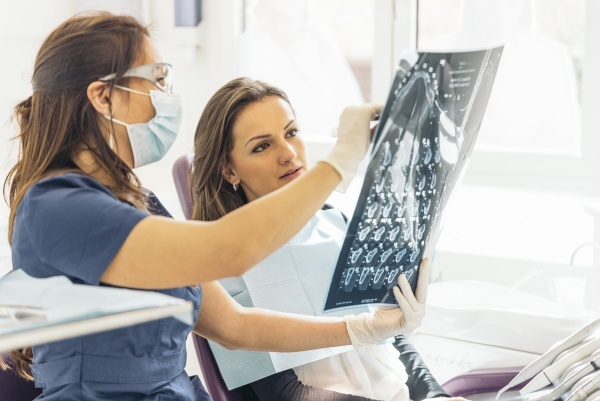 If you are concerned that you may lose a tooth or if you are thinking about switching from dentures to something more permanent, then it is a good time to speak with your dentist. If you do not have a dentist, then call our office to learn more about dental implants and see if they will work for you. Request an appointment here: https://www.emersondental.com or call Emerson Dental Associates at (201) 620-9998 for an appointment in our Emerson office. « How Long do Dental Crowns Last?